Today I'm going over to a wood shop near my home to discuss plans for some wooden toys for my little niece (due date in August). I'm excited and can't wait to see how they turn out. Here are two of my "inspiration" pictures I will be sharing with them. Nothing too fancy. 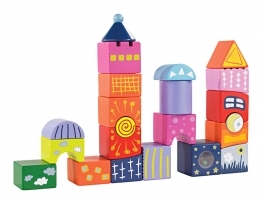 Well the castle one is a tad fancy but I just love wooden toys and since we are on a tight budget, this is a great way to add to our other gifts. I also made her a moby wrap and will be adding the finishing touches to it next week to personalize it a bit.